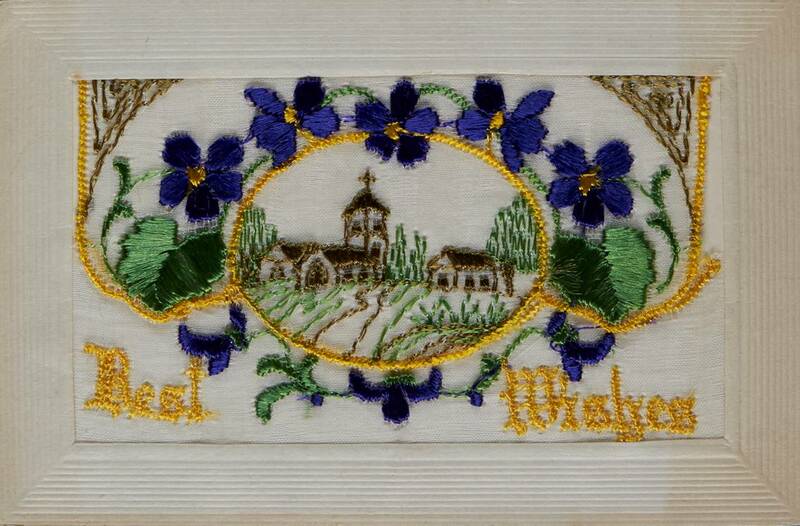 The Norfolk Record Office holds a number of embroidered postcards from World War One, generally known as “WW1 Silks.” They were first produced in 1914 through 1918 but declined substantially from 1919 onwards. 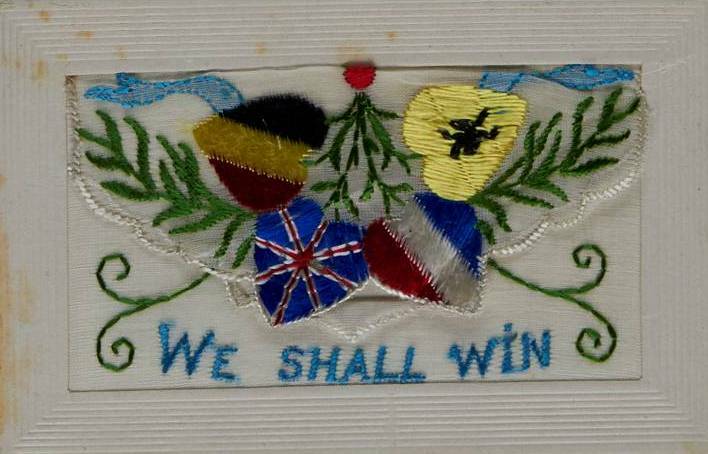 The WW1 cards were usually hand embroidered by French and Belgian women refugees who worked in their homes and refugee camps. The individuality of the embroidery appealed to many British and American servicemen on duty in France and what began as a cottage industry soon blossomed into a production line. The design for the WW1 cards was worked from a picture and embroidered on strips of silk mesh with as many as 25 on a strip. The women were paid to produce 400 of the same design and once completed the strips were sent to factories to be starched, cut and mounted on embossed card frames. It is thought each design took between four to eight hours to complete and the monotony of producing so many of the same design may account for the occasional spelling mistake or wandering stitches which can be seen on some cards. There were many designs for the WW1 Silks, from simple pictures or messages to intricate flags and regimental badges. 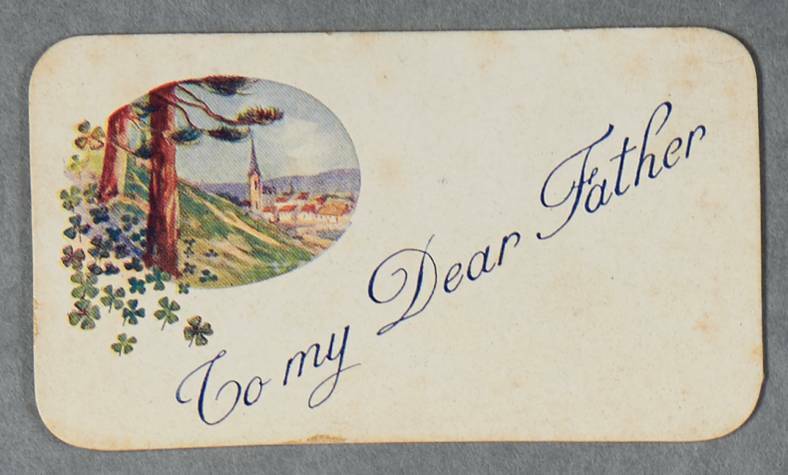 Birds, flowers and butterflies were popular motifs on the more sentimental cards which often displayed messages such as ‘Forget-me-not’, ‘To my dear friend’ and ‘A kiss from France’. Patriotic themes were also widely popular, featuring British, French and American flags, symbols and greetings. Some of the cards had the central portion cut as a flap so that a tiny printed greeting card could be inserted in a pocket behind the silk front and the stiff back. 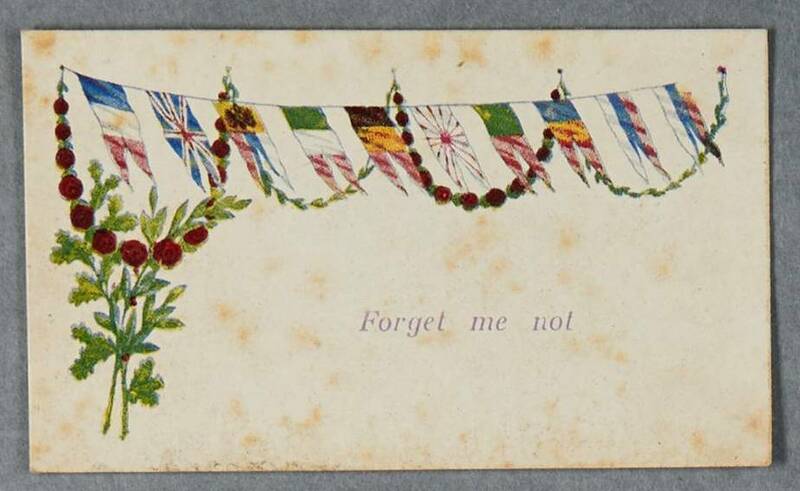 One such popular card was “To my dear Mother” and these inserts could be almost as decorative as the embroidery itself as these examples from The Norfolk Record Office show. Most cards do not have postage stamps as they were mailed home at no charge to the sender in Military Mail pouches. The WW1 silks became treasured mementos from “the boys over there” and are excellent examples of front-line patriotic art quite unique to this specific period in history. 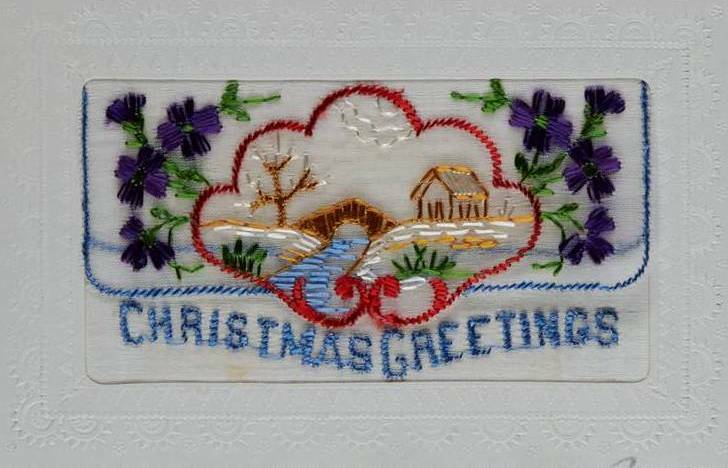 It has been estimated that as many as 10 million handmade cards were produced during the wartime period. In 1930 through 1945 a machine made card was produced which was simpler and plainer with less variations but these silks never regained the popularity of their WW1 predecessors. If you would like to learn how to make your own embroidered card we still have places available for our Adult Craft Session: Embroidered Cards on Tuesday 17th November from 1-3pm. Tailored to beginners during the session you will see more examples of WW1 Silks from the Norfolk Record Office collection, learn some basic stiches and have the opportunity to copy an original First World War design or create your own. The cost of the session is £10 which is payable on arrival. This entry was posted in Snapshots from the Archive. Bookmark the permalink.